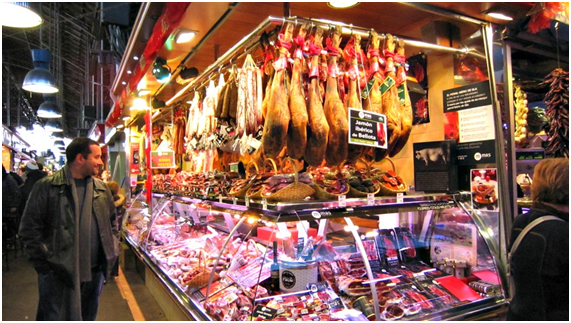 You’ll find all kinds of yummy eats at Mercat de la Boqueria. 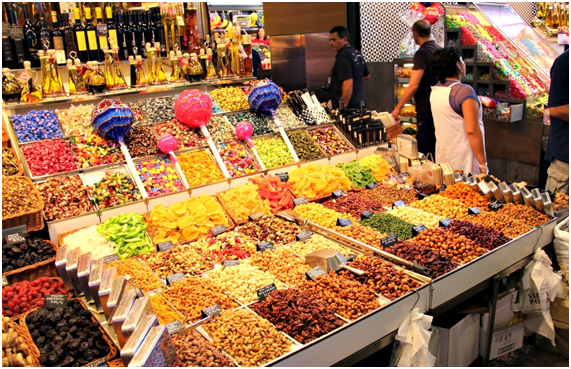 Located off the side of the infamous Las Ramblas street, Mercat de la Boqueria is one of the largest food markets in not just Spain, but the whole of Europe. It dates back to at least 1217, when it was primarily a place to buy and sell meat. Today the bustling market is bursting with hundreds of stalls selling everything from locally-grown fruit and vegetables to meats, fish, seafood, cheeses, dried ham and eggs. As well as the wealth of raw ingredients, you’ll also find a great number of stalls, bars, cafes and small restaurants selling freshly-pressed juices, artisan sweets and traditional tapas, making Mercat de la Boqueria a great place to visit for an early lunch or snack. Although you’ll find entire legs of jamón Ibérico (Iberian ham) hanging from stalls throughout the market, you don’t have to buy a whole one to sample the deliciously rich, salty and intense flavour. Many of the dining venues throughout the market sell small tapas-size plates of the delicacy so you can try a few pieces on crunchy freshly-baked baguette. The perfect accompaniment to jamón Ibérico, queso de cabra (goat cheese) is equally strong in flavour, but has a smooth, delicate texture. You’ll also find this Asturian speciality on sale in the tapas restaurants. 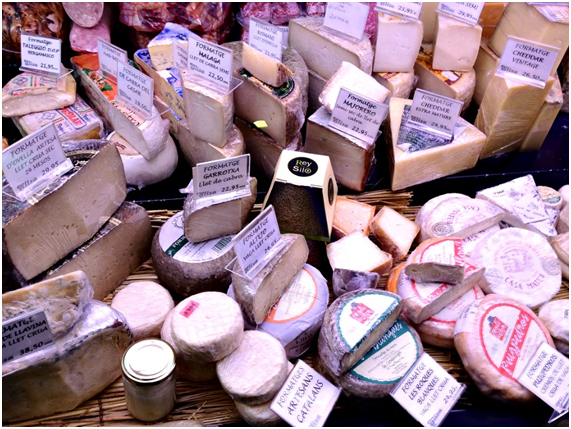 But if you’ve already fallen in love with the unique cheese, you can buy yourself a wedge as big as you dare from many of the stalls throughout the market. You might not think there’s anything particularly special about fresh juice. You probably have it all the time. But you’ve never had it from Mercat de la Boqueria before. 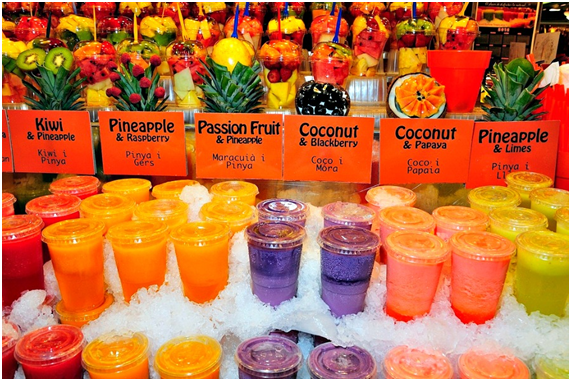 Inside the market you’ll find almost every fresh fruit stall blending fresh delicious juices constantly. With flavours ranging from the ordinary apple, orange and pineapple to the more exciting mango, passionfruit and guava, there’s something to suit every palate. Not everyone is nuts about nuts, but the Fruita Seca Morilla stall in the centre of Mercat de la Boqueria is well on its way to changing that! 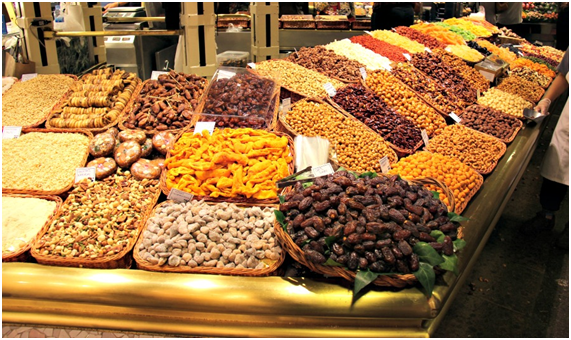 Here you’ll find no fewer than 15 different varieties of crunchy, buttery almonds. Whether you prefer yours whole, sliced, roasted, raw, salted, spiced, sugared or covered in dark chocolate, you can pick them up here. Stay with us: book your family room in Barcelona now!